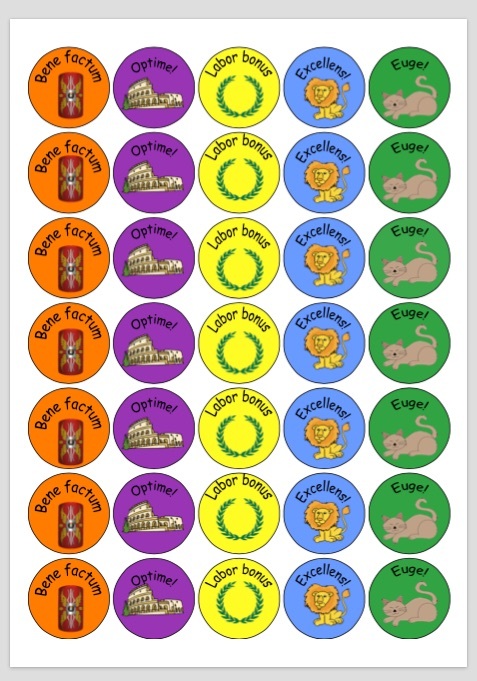 Twenty one subject label stickers, perfect for the front of books and topic folders - for topics on the Romans and Greeks. 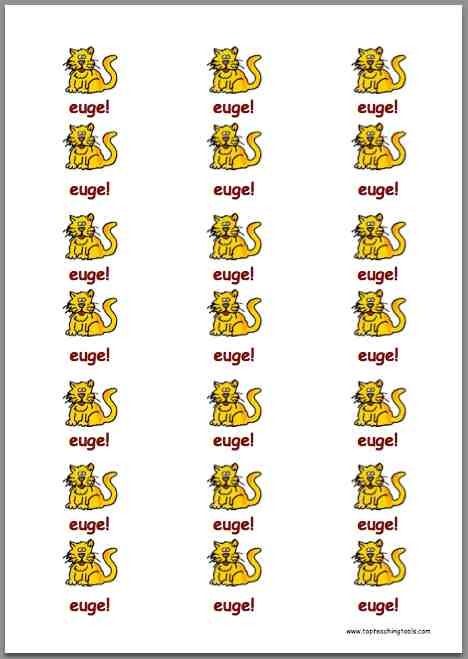 Download the sticker sheet and print onto A4 standard sticker sheets (3 columns by 7 rows). You can then print and use these whenever you require them again. £0.99 per sheet. 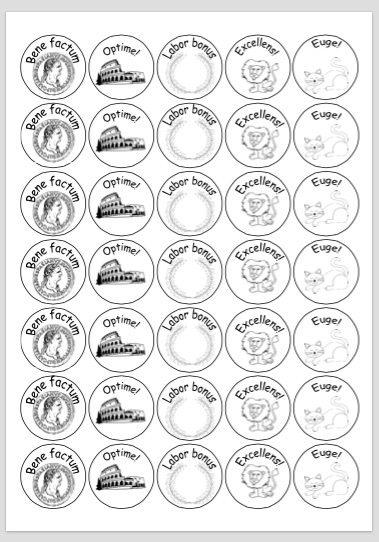 Twenty one subject label stickers, perfect for the front of books and topic folders. Download the sticker sheet and print onto A4 standard sticker sheets (3 columns by 7 rows). You can then print and use these whenever you require them again. £0.99 per sheet. Our topic display title lettering will enhance your display boards! 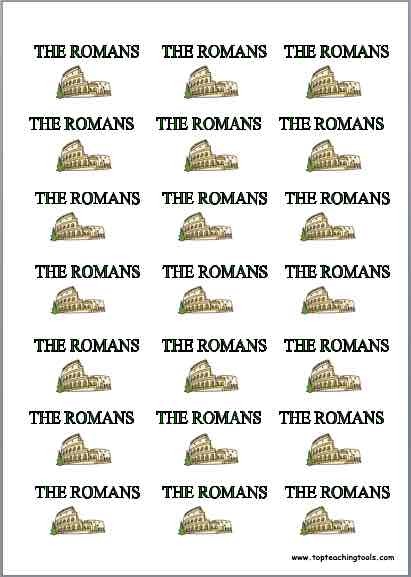 Each title: 'The Romans' is produced in both upper and lower case and in two different sizes, to suit all display boards. Once you have purchased them, the letters will arrive automatically via email. Simply print out the lettering you require, cut out, laminate and display. 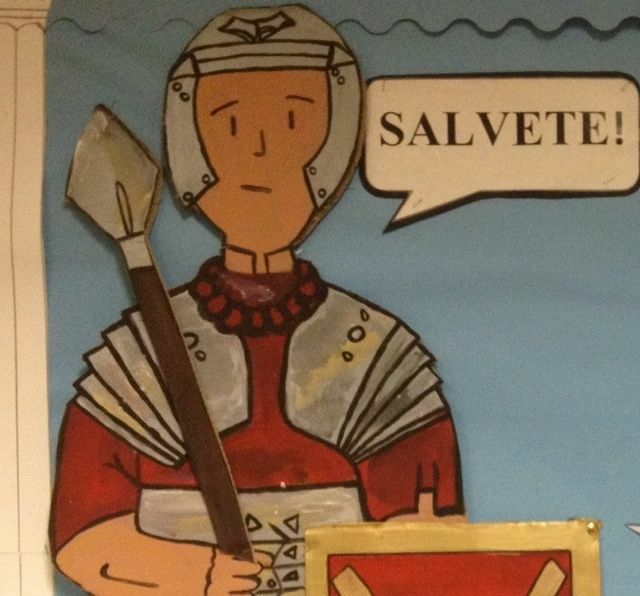 Our Roman Army topic display title lettering will enhance your display boards! The titles are in three different sizes, to suit all display boards. 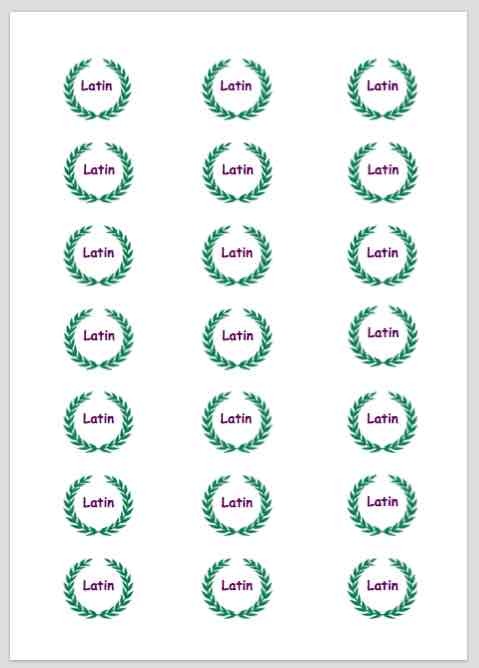 Twenty one Latin merit stickers, perfect for marking. 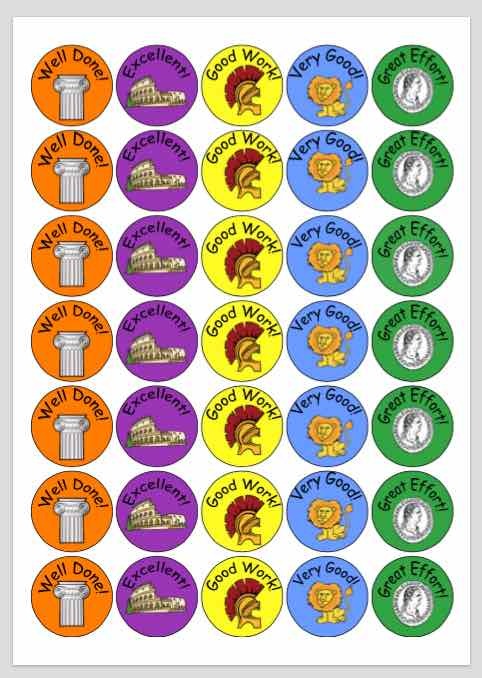 Each sheet has a different picture and different Latin word of praise. 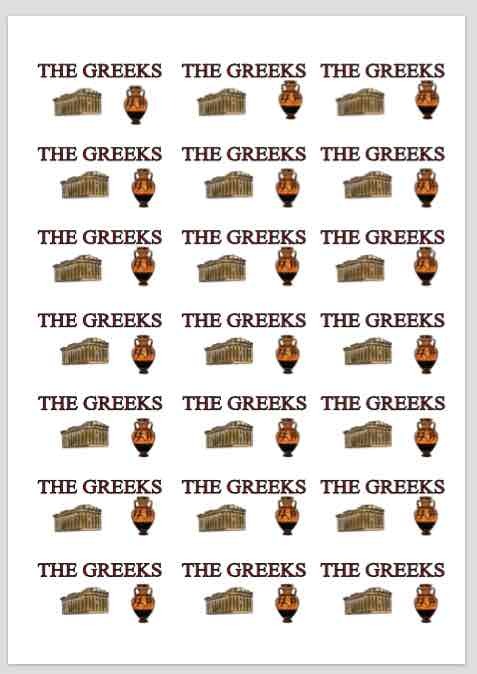 Download the sticker sheet and print onto A4 standard sticker sheets (3 columns by 7 rows). You can then print and use these whenever you require them again. £0.99 per sheet. 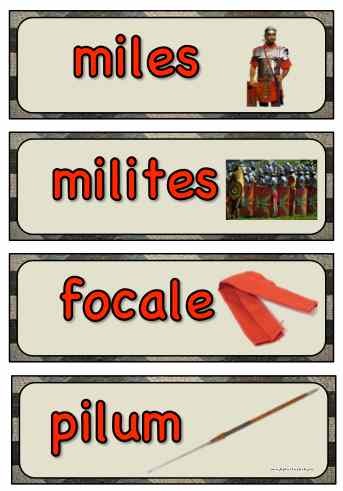 A number of beautiful quality display labels and topic words ready for a Roman Army display - words are in Latin. Simply print out the labels you require, cut out, laminate and display. Only £1.50! 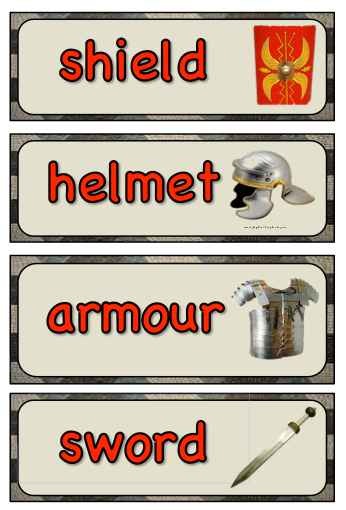 A number of beautiful quality display labels and topic words ready for a Roman Army display - words are in English. Simply print out the labels you require, cut out, laminate and display Only £1.50! You would probably be surprised by how much Latin you already know. Hundreds of words are all used in everyday English. 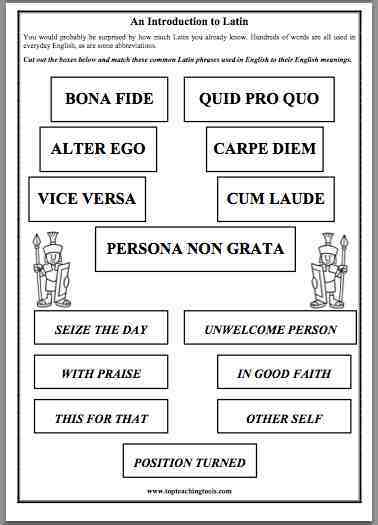 Download this resource for some fun differentiated Latin language derivation work. 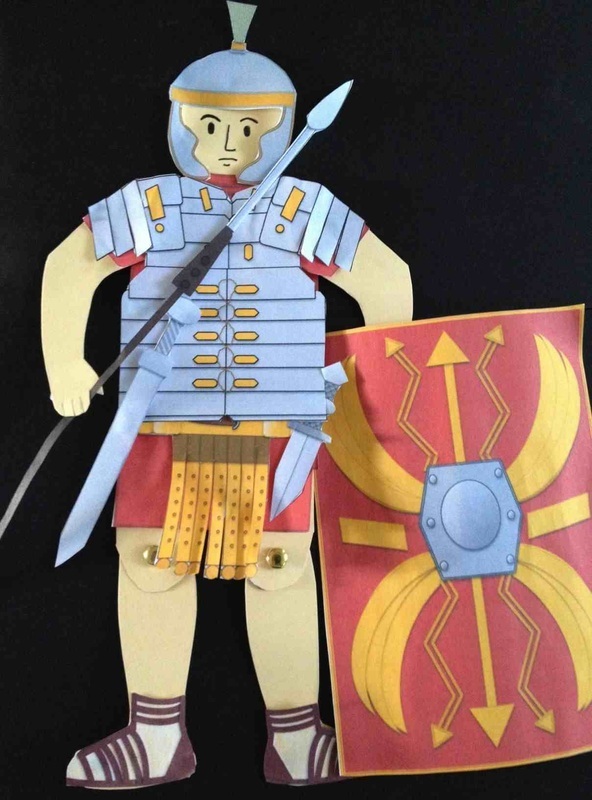 A fantastic template for making a Roman Soldier - his arms and legs move too! Full instructions, costumes to add and weapons included. We have included coloured versions and an alternative black and white copy for children to colour their own versions and make in this pack. 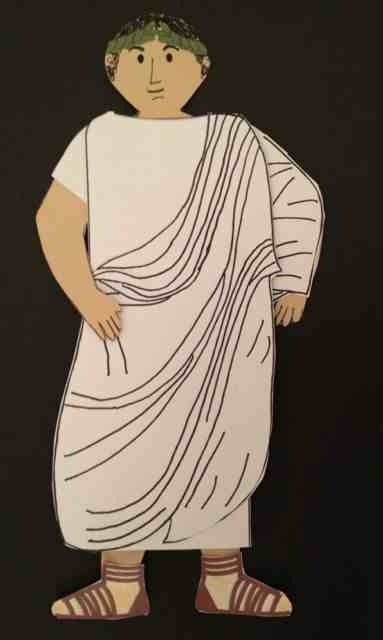 A fantastic template for making a Roman - his arms and legs move too! Full instructions and costumes to add. Coloured version and an alternative black and white version for children to colour and make in this pack. 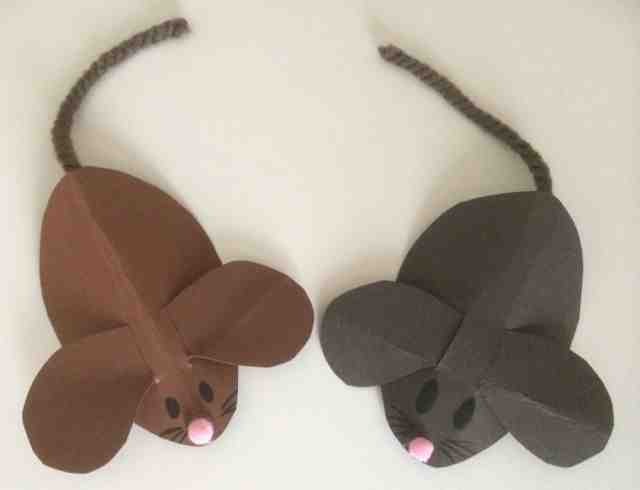 Simply print out on card, cut out and attach. Brighten up your classroom with our popular display posters. This pack is suitable for primary and secondary schools. 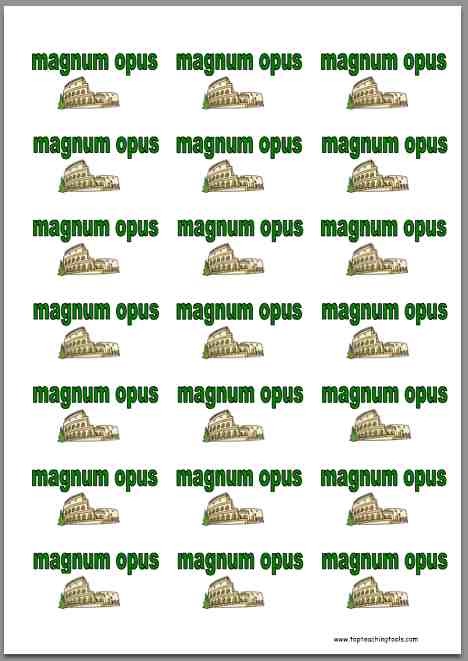 * 32 x A5 display poster scrolls, each showing a Roman Numeral. Numerals include 1 to 10, multiples of 10, and numerals for 100, 200, 500 and 1000. 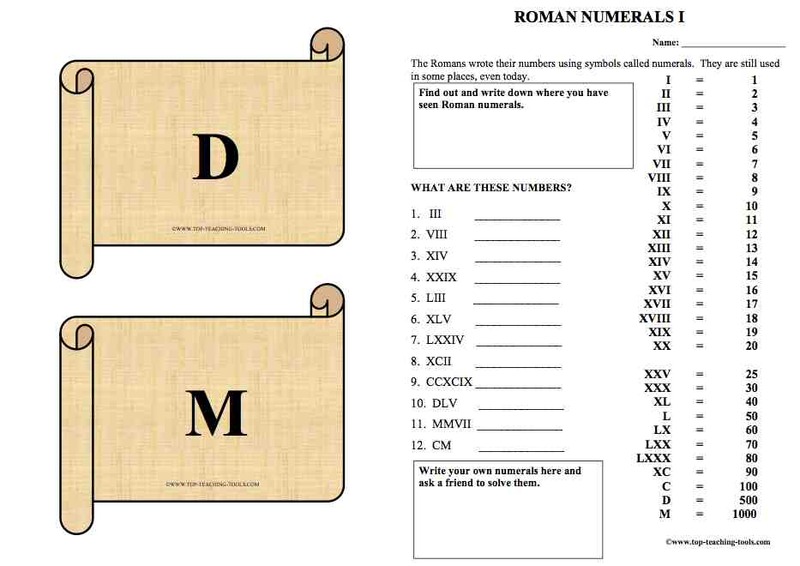 * Two worksheets on Roman Numerals. 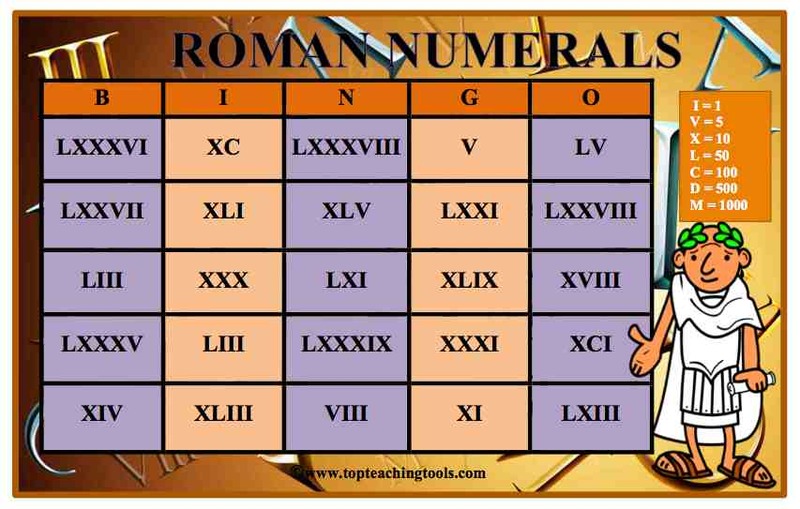 Display our Roman Numerals in the classroom. We recommend that you laminate each sheet for a longer lasting display. 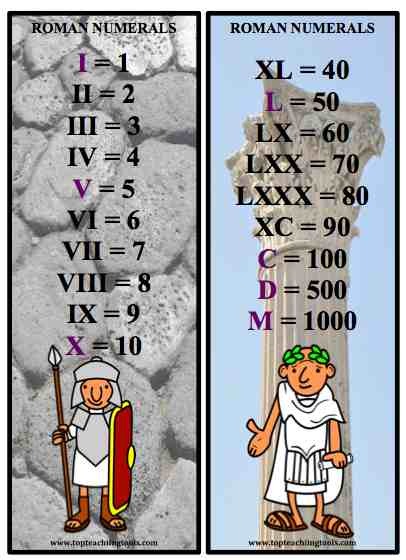 Help your class to learn the Roman Numerals. A fantastic game your class will love to play and will want to keep playing! Simply print off and laminate the ten bingo boards, caller's number square and counters. Children can work in pairs. 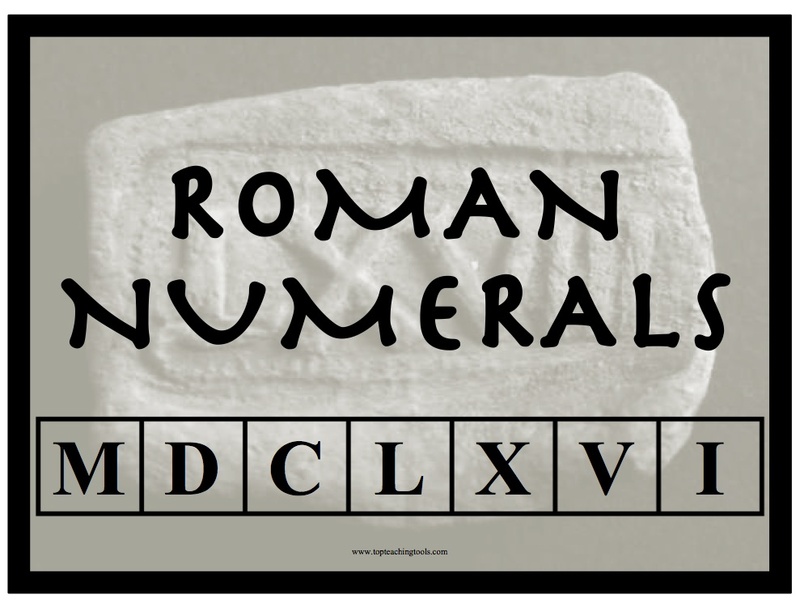 Worksheets and activities on Roman Numerals. 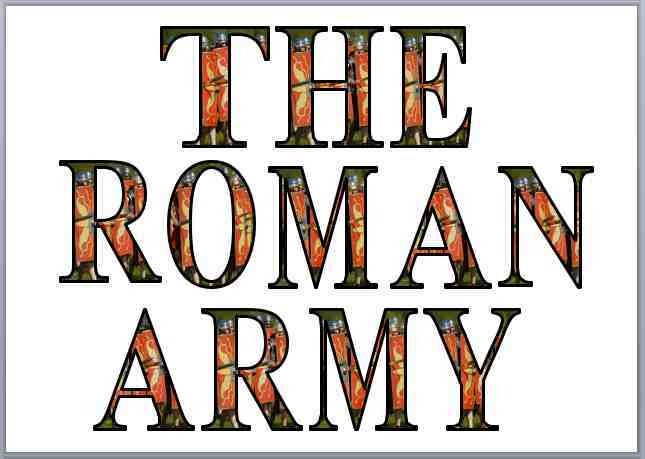 The Roman Empire lasted for several hundred years, and the Romans left an enormous legacy. 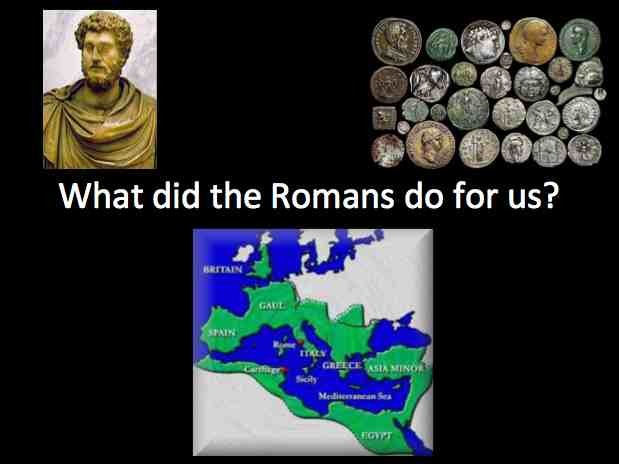 This powerpoint takes you through the main legacies that the Romans left us, that have relevance to us today. 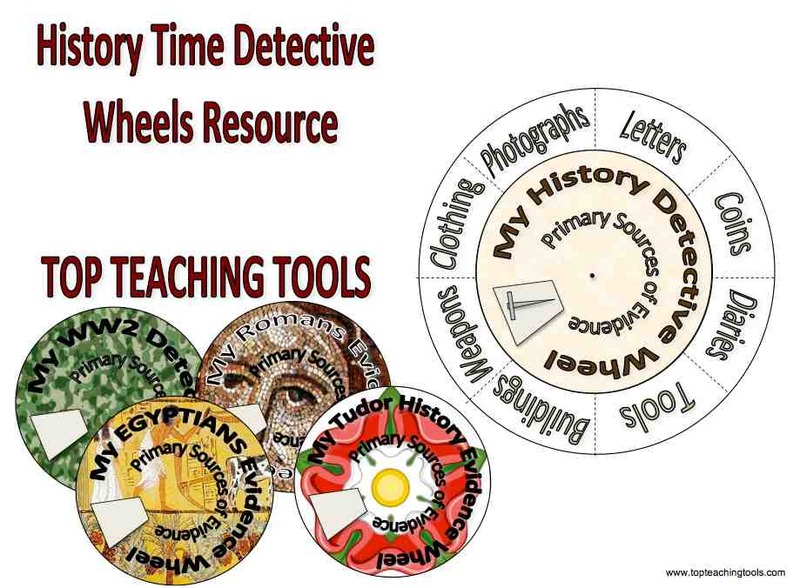 This fun resource wheel can be used in the study of any period of history, or in learning about history skills, such as historical evidence, using primary and secondary sources of evidence. Pupils make and decorate the evidence wheels themselves. The wheels come with full instructions and examples. 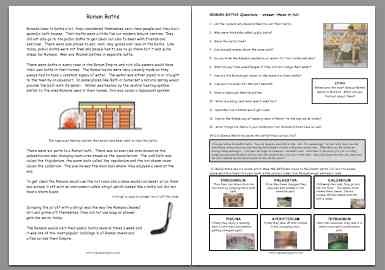 The Romans is a book of photocopiable worksheets aimed at Middle/Upper Primary (KS2) pupils and written to support the curriculum schemes. 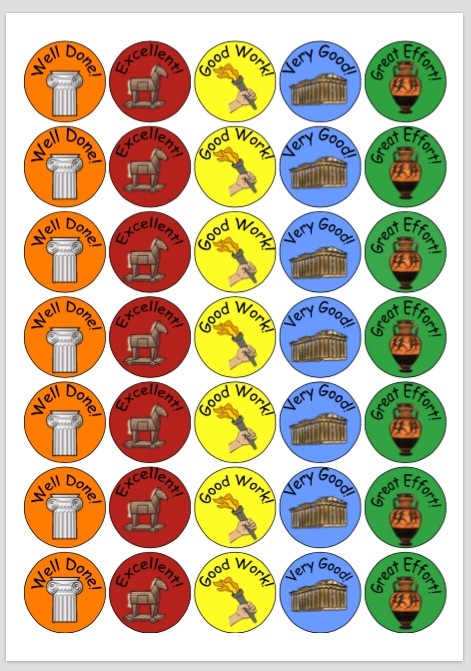 It is a must for any teacher teaching the Romans topic.